Prep Day – Boil about 4 pounds uncooked potatoes until tender. For faster preparation, start with instant or refrigerated prepared mashed potatoes. 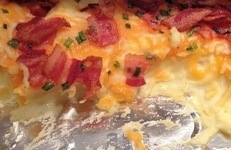 Place all ingredients, except cheddar cheese and bacon, in large bowl. Beat with electric mixer on medium-high speed until potatoes are smooth and creamy. Spoon mixture into lightly greased 13×9-inch baking dish. Cool completely. Sprinkle with cheese and bacon. Cover and freeze. Serve Day – Thaw. Preheat oven to 350°F. Bake 30 minutes or until heated through. When heated through and ready to serve sprinkle with green onions. Note: Best served with Savory Chicken from May 2012 Menu.